We are hairpups.com a family team who runs a sound breeding program with proper early handling and training of our grandpups. We chose not to call ourselves a kennel as each of our dogs are our children and their puppies our grandchildren and none are kept/raised in kennels. We are not a pet store, kennel nor are we a puppy mill. We named ourselves hairpups because each of our babies has hair not fur making our beautiful puppies hypoallergenic. Each of our babies are our pets and all are raised in our home with free run of the house and fenced in yard. We have installed many doggie doors through out our home over the years to aid in the free running. We often say we just pay the bills it's their house. We believe it takes many things together to make a complete solid healthy and happy puppy family member and we do all of them and then some. We use the finest representations of the Havanese mom's and dad's that have passed their health test through Cerf and Offa and are registered. We hand raise each of our grandpuppies in our home to produce puppies that are smart, eager to please, well socialized and great with folks of all ages as well as other pets. We breed strictly for health 1st then temperament and conformation to the breed standards. We start training our babies for the crate and pee pads before they go home. 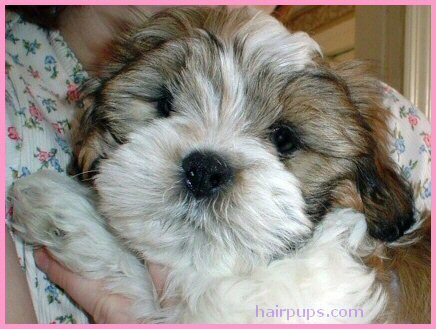 We specialize in all colors of Havanese including yummy Chocolate's. My story started in 1984 when I was just a preteen, on one of my many walks I found a local breeder that lived close to our family home. She would let me bath and groom the pups as well as feeding the adults. The seed of my love for animals was started and I knew at some point I would have my own program. I started my breeding program in 1997 when breeding was just a hobby for me. I had acquired a male Max from a local breeder with hopes that he would be a good daddy dog. By the time he was 3 months old I knew he had an aggressive side to him. When he was a year he turned into Cujoe! He was endangering my young son and everyone in the house by biting us. This was my reality check. I just assumed that every breeder had a kind heart and did it for the right reasons with love. I was proven wrong time after time with breeders who just didn't do it right and they would misrepresent what they were selling and how the pups were raised. We as an average family knew that taking on what I call a kennel or puppy mill pup was overwhelming. In my years of breeding I have seen pups kept in wire cages, horse water barrels, a trailer, baby pools, garages, barns, outdoor dog houses, chicken coops, outdoor kennels and other disturbing places. It was literally a toss of the dice if you would get a good or bad behaved dog, to us bringing one of these puppies home is not a good situation to put any child into. So, we decided that breeding for the average family with children was what we would go about doing. Although we have paid top dollar for our show lines and health testing, it is much more important for us to know that our babies are well taken care of as part of a family and loved beyond belief. We family hand raise our pups so that they only know love and positive training. It is a misconception that all pups are sweet and obedient when they are born. It is all taught from day one or in most cases not taught. I keep a picture of our Max so that I never forget to breed our babies with love and for the right reasons. We did rehome Max and were relieved that we did not have to put him down. He went to an older persons home where he was the only pet and it worked for him. Thank God! Along with breeding babies right by hand we, a reputable educated breeder also show them. Although we are just starting out handling our babies my husband is really liking it. We like to call him the dog man. He started taking one of our chocolate havanese Hershey to some basic obedience classes held by our local kennel club and has been encouraged to amateur handle. He did very well his first time out on May 31, 2010. Brian took a 4th in the handling. Hershey our chocolate havanese took a Best of Breed, 2nd place in the toy group, 1st place puppy and another 2nd place ribbon. Brian will be doing some handling in the summer 2012, if you happen to see him out there give him some kind encouragement! We offer at least one year genetic health guarantee and we alot you 7 days for you to have your new puppy checked out by the vet of your choice to confirm the health of your new puppy. We have DNA tested each of our breeding stock that isn't born here with AKC before breeding to ensure each animals pedigree. We do specialty testing on mom's and dad's for Offa Patella, Cardiac, Cerf and Baer according to age. We offer a help line if you need any advice or information on your new baby. Each of the vaccinations are given according to age as well as worming on a regular schedule. Each puppy is checked by our vet before going home to ensure you and us of their health. I hold an AAS Degree and worked in the field as a Lab Technician for almost 9 years. This has helped us set up our own mini lab at the house where I am able to do all kinds of testing to make sure our babies do not have worms or parasites when they go home. I have also worked in a vet's office for several years as a vet tech. I have taken college courses and have earned a college certificate in Animal Care - Dogs (pre-vet) which entailed temperament testing, dog conditioning/how dogs learn, obedience instruction/training through play, basic vet issues and canine behavior problems I have also earned a college certificate in Holistic Animal Care which entailed herbal remedies, t touch, aromatherapy and Chinese medicine. I have read tons of books on the Havanese breed, canine behavior and canine positive training techniques to aid in training our babies right from the start. You may spend alittle more money now for one of our babies or you could be spending bundles for the life of a kennel dog or puppy mill puppy. We feel we are educated and experienced breeders who have a keen understanding of the science of genetics as well as the art of properly handling and training a puppy. Bottom line if you are looking for a great family member that can be trusted around your children you have come to the right place. Copyright 1999-2017 HairPups - All Rights Reserved. Images/graphics from this website may Not be copied/redistributed..